About 60,000 years ago, the first Homo sapiens were just beginning their move across the grasslands and up the ladder of civilization. Everything since then, as they say, is history. 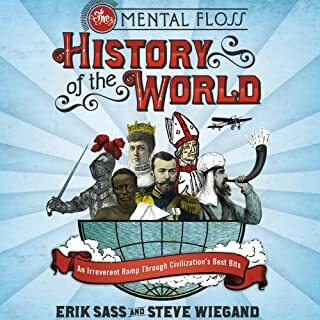 Just in case you were sleeping in class that day, the geniuses at mental_floss magazine have put together a hilarious (and historically accurate) primer on everything you need to know---and that means the good stuff. 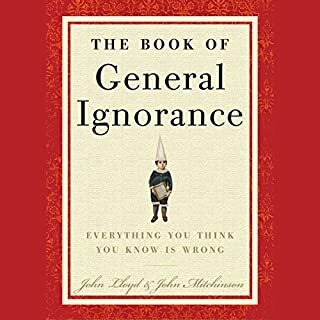 Challenging what most of us assume to be verifiable truths in areas like history, literature, science, nature, and more, The Book of General Ignorance is a witty gotcha compendium of how little we actually know about anything. It'll have you scratching your head wondering why we even bother to go to school. 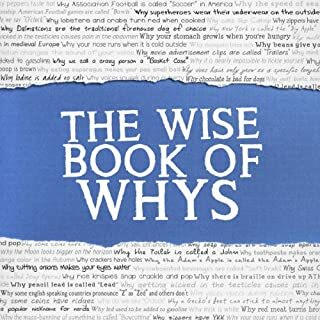 Revealing the truth behind all the things we think we know but don't, this book leaves you dumbfounded about all the misinformation you've managed to collect during your life. Most of us are clueless when it comes to the physics that makes our modern world so convenient. What's the simple science behind motion sensors, touch screens, and toasters? How do we glide through tolls using an E-ZPass or find our way to new places using GPS? In The Physics of Everyday Things, James Kakalios takes us on an amazing journey into the subatomic marvels that underlie so much of what we use and take for granted. Have you ever had that moment when you are in the middle of a conversation and suddenly the room becomes quiet and nobody knows how to move the discussion forward? Of course you have. Haven't we all? That's why I decided to write this book. What better way to break that silence than to throw out some of these facts: Gorillas spend up to 14 hours a day sleeping; one-quarter of the bones in your body are in your feet; and much more! Now I know a bunch of random facts! This was a great book to have downloaded for those quick drives or when you're in between books. It's what you'd expect, so get ready to wow your friends with miscellaneous trivia! I would put the book on and listen to it while I worked, or cleaned up the house. 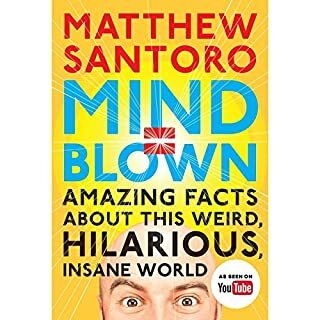 The hundreds of short facts are almost all interesting, so it was a fun book to listen to. And now I can annoy my friends and family with all these facts! A book full of "believe it or nots"
This book reminds me of the old "Believe it or Not" segments. Granted this book is generally more "scholarly" than stories of bee beards and people who type every number between zero and a million, but it is basically a book of very short interesting factoids. I was not always convinced that the author's facts were exactly right. In some areas where I knew a little about the topic I found myself skeptical about the complete accuracy of his statements. But, I did manage to finish the book. If you like this sort of random bits of information, this is one of those books well suited for the short commute when you just don't have time to really get wrapped up in a plot. It sites Wikipedia, and rarely contains enough information about any fact to be interesting. Only about 25% of the content can be considered novel. This is a fantastic collection of facts and stories. I was thoroughly impressed. Engaged the whole was through! 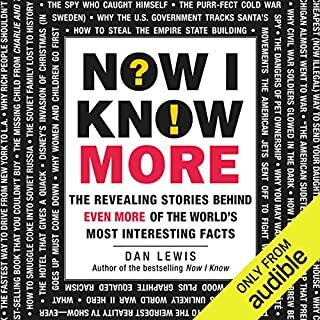 This is an excellent book with bite sized (around 5 minutes or less) chapters about various facts. Not interested in the fact currently discussed? It'll pass soon. Not all facts are equally interesting, but they're all amusing one way or another. If you could sum up Now I Know in three words, what would they be? Thought Provoking! (Only needed two) The book is full of obscure facts and thought provoking facts nicely presented. 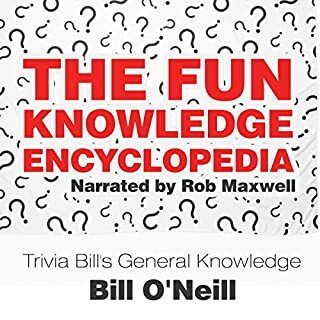 If you are a trivia hound this the book for you. There were not any characters in the books just list after list of thought provoking facts and of coarse I can't think of a single example to give you right now, (MS BRAIN no short term memory) But I liked all the facts and figures. What does Jeremy Arthur bring to the story that you wouldn’t experience if you just read the book? A nice voice if a little montoned in parts, But it was nice to sleep to. There were so many it;s hard to pick just one, (Or in short my MS Brain can't remember one right now but as soon as I walk away and stop doing this I will remember a dozen.) There really were dozens of facts that were all cool. Very good book that I really enjoyed. Wish I had a better memory to give you more facts. But it was very good and informative. I did find the narrator a little monotoned somewhat, but the book itself was a lot of fun. I truly enjoyed it. .
Would you try another book from Dan Lewis and/or Jeremy Arthur? No it as basically like listening to a blog. It is a collection of trivia so no really ending. Maybe I tend towards a deeper knowledge of news. I did't find enough of the revealing stories to be that unknown. Not enough hits to out weight the misses.I want to remove it from my Audible library so it doesn't clutter it up. Interesting topics I learned a lot. It’s an interesting book with short chapters on each topic.Easy listening at 1.5 speed. I listened to it twice ! Not much here. Yes it is entertaining at times but each is too short to learn much about any of it. This was very easy to listen to and extremely interesting. The facts contained within were excellent. 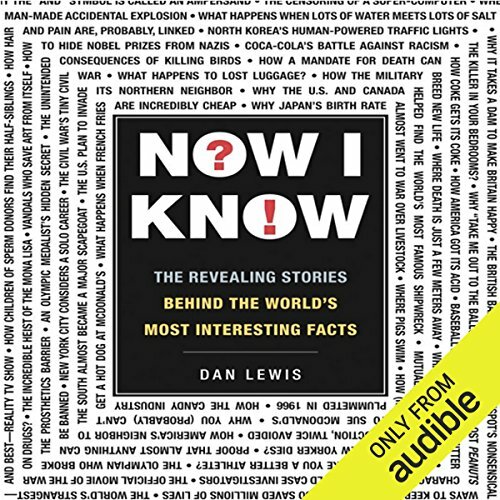 Can wait to listen to the sequel 'Now I know more' . My young son also loved this as his brain is a sponge for facts. I would imagine there is a lot of work goes into a book like this, and appreciate the authors time and effort to bring this kind of information to people. I hope there will be more in the future. Until then I will subscribe to the daily emails. Big thanks Dan Lewis and to all involved. What did you like best about Now I Know? What did you like least? I enjoyed the style of the book and the narration, and there some very interesting pieces of information, but I found the overwhelming bias towards the USA (politics, sport, economy, history, popular culture) quite boring. A lot of the chapters mean nothing to a non American. Now I know, but I didn't want to know in the first place. A good listen of relatively random facts. useless yet useful facts all read in am engaging style that doesn't get bogged down or repetitive. a worthy listen if you dont really want to concentrate on a story etc.